Easy Car Parking in Village on street or free car park just 150 yards away. No street time restrictions. Overall very good, starters 1st class, mains very good. Sweet menu all very similar and sadly limited, however overall a very pleasant experience. Food was pretty good but the service was a bit shaky. Our mains appeared simultaneously with our starter being cleared away. Has a lovely meal with family. Great service matched by the quality of the food. Would highly recommend. Absolutely fantastic food and service. Even with the set menu for valentines they offered alternative vegan dishes. Could not have been better night. Two of our party were vegan and they thought the menu and food excellent. I could easily have eaten what they had and I’m not vegan. Our food was also excellent. Excellent food,and a great warm cosy place. Staff excellent. Our group of 7 had a great time Beowulf highly recommend. We have visited this restaurant before and found it to be a pleasurable experience. We have always been impressed with the separate vegetarian/vegan options. However, on this most recent visit, it seemed as though we had stumbled upon a different place. On arrival I informed staff that we had booked a table. We were told to go and pick a table, so there was no specific one reserved. The menu did have a vegetarian/menu but not as extensive or as interesting as before. My starter of hummus was not the smooth & silky delight I had been expecting but was more like chunky mashed chick peas . Two of the main courses - sweet potato burger and a lion burger were OK, but nothing special. My main of marinaded portobello mushrooms was so overpoweringly flavoured with ginger that I only managed to eat a third of it. The predominant flavour of the seafood risotto was cheese. The clearing of the table was quite sloppy, napkins, cutlery and food were not cleared away before the dessert course. My ice cream again was nothing special and was unnecessarily decorated with what I thought were inedible silver balls. I didn't want to risk a dental accident by trying them. The most disappointing aspect of the evening was the fact that it was a special occasion. I had spoken to a young man on the phone to arrange a different start time and had told him that we would be celebrating our wedding anniversary and my husband's 70th birthday. In the event, no mention was made of it at all. I was not expecting any complimentary items but a mention of the occasion would not have gone amiss. I cannot understand the dramatic change in the service and standard since our last visit. A very underwhelming experience which we shall not be in a hurry to repeat. Such a shame. When I arrived was informed I was too early to be taken to my table ( it was actually empty). Was advised to take a seat and waiter would come and take our drink order - waited half and hour and he did not arrive. Approached a waitress and was shown to table straightaway. The food and service was good, plenty of choice on the menu. On of the loveliest pubs I’ve come across. Absolutely delicious food, lovely setting, an absolute gem of a place. Went for my mum’s 80th birthday. A lovely little pub with a fantastic atmosphere. The staff who served us (Eleanor & Andrea) were delightful, they couldn’t do enough for us. The portions are a good size and the food is delicious. We’ll definitely be back. Really nice food, great service and very friendly staff. Pub in the front was cosy and atmospheric and the tables in the restaurant were nicely placed, clean and not too noisy. Recommend. We had a lovely meal for our mum’s birthday. The golden lion catered especially for our little 2 year old granddaughter with a plain simple meal (I did ask in advance but they were very helpful). The staff very friendly and warm, the food was creative tasty attractively presented. It was quite busy so it was a little slow to arrive but worth the wait. The staff were fantastic here this evening. Very accommodating to get a table sorted in a very busy bar area as we had a dog with us. Food delayed as extremely busy but that was not an issue at all. Real lovely feel to venue, food was excellent! Deffo will return and very soon. Thanks very much guys, great night had. Great food, but a bit of a wait for table even though booked - was a few big groups in, so I’m sure this was just unlucky timing. Would go again. Excellent food and staff very attentive. The only issue was that we were dining on a Sat night (7.30) and the restaurant was full of noisy children. I really don't mind children being in Restaurants with parents but would have preferred somewhere quieter on Sat evenings. This is not a criticism as I could have asked at time of booking but an observation. Great service and welcome. Excellent menu with vegan and vegetarian options. Food was beautifully presented and very tasty. Have already booked for next week and will be booking for Xmas as it has a great menu with vegan and vegetarian options. We had family Sunday lunch in the Golden Lion last weekend, the food & service was fantastic. I would highly recommend the Lion - it is our favorite place to go for drinks with friends or food with the family by far. Had family visiting and wanted an early dinner as we were taking our 18 month old with us. Everyone thoroughly enjoyed their meals and the staff were also very accommodating with our baby. The whole experience was very enjoyable. The food was excellent, the service was friendly and efficient, the dining area is cosy and the ambience of the pub is very welcoming. This is a lovely pub restaurant in a quiet little town. They boast a really decent vegan menu - the cottage pie was amazing and then the rice pudding was elevated beyond a home cooking staple by the presentation and the extras. My meat eating (difficult to impress) friend was also very pleased with her choices. My only comments in terms of improvement would be that some research into the vegan wine options would be very much appreciated, and also that at the end of the meal we would have appreciated more time to sit and chat without being brought the book then asked every 2 minutes if we would like to pay now (maybe we looked like likely suspects for a dine and dash?!). Overall we really enjoyed our evening with you, and will be back. A friendly greeting when we arrived. The restaurant was not too busy so we were led to our table immediately. Our starters arrived after a short wait. My wife had the Pork & Pistachio Terrine. She felt that the terrine was a little bland and there was not enough toast but she loved the Red Onion Marmalade. I had the Crispy Calamari and it was cooked to perfection. For our main courses my wife had the Nasi Goreng and she raved over it. I settled for the BBQ Blade of Beef and was not disappointed. Overall it was an excellent way to celebrate our 20th Anniversary. Exceptionally good food and great value for money. For me the blade of beef was tender, beautifully presented and the taste was fantastic, I could not fault it. The Golden Lion never disappoints and the atmosphere is great. Excellent service and the food is incredible! Visited over Christmas with friends and was pleased with all aspects of our lunch. Food was great quality and good sized portions. We all thoughly enjoyed our meals and we will definitely be returning very soon. The food was excellent. Thank you. Disappointed at the lack of choice considering the extensive menu options they have in the restaurant. When we arrived at our table we were told we could only order from the one one menu. Either the four of us could order from the Xmas Menu or the normal bar/dinner menu. Nowhere prior to the booking was this mentioned to us; only when we arrived at our table. Considering we choose this restaurant because our party consisted of an 89 year old (very plain eater), a dairy free son and two adults (try anything); We thought we could order what we actually wanted; not the case! We really could not understand this policy as the restaurant was fairly empty for our booking at 7pm. As this was my wife’s birthday celebration she choose the Xmas Vegan Menu as it made life easier for our son. Unfortunately this only left one real choice for our mother; the very large cottage pie ( she left most of it as it just wasn’t to her taste). Overall we were disappointed with the night. The vegan menu was quite nice for the three of us but no good to our 89 year old. The inflexibility of the menu options was bonkers and we couldn’t understand why we couldn’t just eat and order what we wanted. The meal for the four of us cost £150 with drinks but we felt short changed as we know had we been able to order from the dinner menu we would have had a far better evening. We felt the most stupid issue was that had we been able to order from all of the menus we would have spent a lot more than the £150 so this menu policy is just crazy. Had we known how inflexible this restaurant was going to be we would have booked elsewhere but as you only find out when you get seated at your table it’s very misleading. 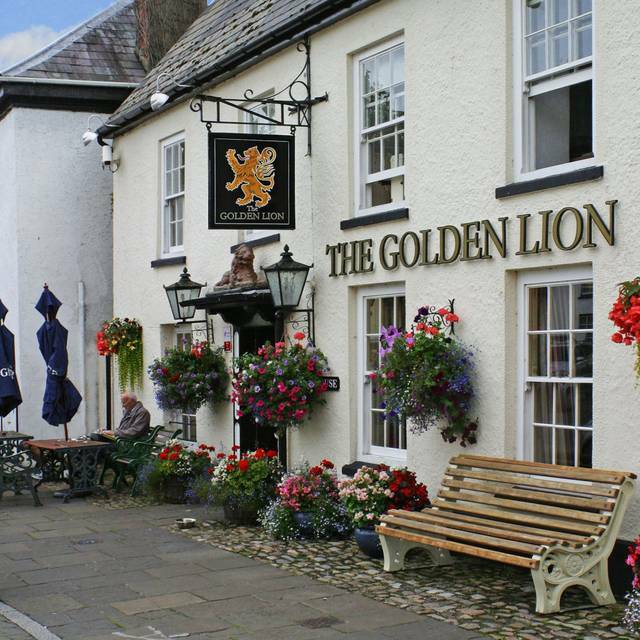 We have always felt that the Golden Lion is one of the best places to eat it the area but on this occasion we have left feeling disappointed because of a silly menu policy. Excellent food, service and value for money. Look forward to my next meal here. Arrived early and waited in the bar area for while. Service was excellent - just about the right length of time between courses. Very pleasant staff and good choice of food. The food was very well presented with the exception of the Golden Lion sundae which did not compare with the standard of the other food. Fairly expensive but well worth it. We would definitely go again. We meet friends who live in Bristol here for lunch a few times a year and the welcome,service and food are always good. I’ve never given 5* for a review before. I had high expectations after watching Dion two years in a row at the Newport food festival and having tasters of food he prepared in front of us as an audience. This year they gave out a voucher, so an excuse to visit! I went for date night with my partner, a fairly local pub for us. As we approached the bar we were greeted and seen to, drinks in hand we made our way to comfy sofas to wait. Its didnt seem like waiting, we were able to enjoy our drinks in a relaxed, warm atmosphere with the buzz of other peoples concersation in the background. Given a menu to ponder, our orders were taken whilst still in the sofa. A few moments later we were seen to our rable, coats taken for us and met with our starter. Plentiful bread and olives platter to start with oils and butter. Shortly after our mains arrived, blade of beef with the poshest but tastiest mash ever with a gravy to leave you wanting more. And a steak with proper chips and tasty side sauce. The portions were generous and we we did not feel rushed, nor asked about our food whilst with a mouth full (which always seems to happen). Ambience thoughout was lovely and the decor refreshing. Final check - the toilets, modern, clean and freshen up toiletries for the women which was a lovely touch. We left wanting to return, possibly sooner rather than later to try out the desserts and other tempting dishes. Thank you to the staff, two men and a women that served us you’re a credit the team and kitchen staff it goes with out saying you’re in the right job! I would recommend this place for food to anyone! Outstanding meal and excellent service all in a great location.